R.J. Barrett, Tre Jones, Cam Reddish and Zion Williamson talked with MaxPreps back in March at the McDonald's All-American Game. Four of Duke's Fab Five sat down with Chris Stonebraker back in March. The men's college basketball season tips off Tuesday with an immediate and emphatic slam dunk — a showdown between preseason No. 2 Kentucky and No. 4 Duke at the Champions Classic in Indianapolis. 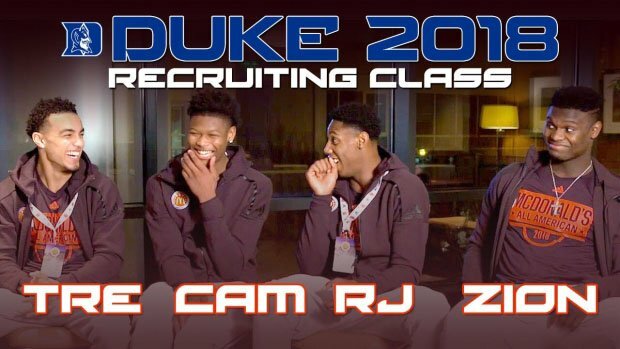 Besides the enormity of pitting two of the sports' blue-blood programs, almost all eyes and storylines center around Duke's much ballyhooed freshmen class that features — at the time of their signing — the top three prospects and four of the Top 10 in the 247Sports Composite. That includes everyone's No. 1, R.J. Barrett, the 2017-18 MaxPreps National Player of the Year from defending national champion Montverde Academy (Montverde, Fla.). MaxPreps host Chris Stonebraker sat down with all four top recruits — Barrett, Cam Reddish, Zion Williamson and Tre Jones — in an exclusive 1-on-4 interview just before the 2018 McDonald's All-American game. "Tre can go for 30 points and 17 assists the same game," he told Stonebraker. "Cam is just a bucket. And R.J. is going to kill it no matter who he plays against." Add in the team's fifth top freshman, No. 43-ranked Joey Baker of Trinity Christian (Fayetteville, N.C.), and it's no wonder why this group might be the most talked about quintet since the original "Fab 5" — Michigan's Class of 1991 that featured Juwan Howard, Jalen Rose and Chris Webber. "I just can't wait to get to Duke," Barrett told MaxPreps in March.